So, I just heard from the psychiatrists office today. They just completed the review and wanted to send it to my doctor. I gave them his name and address and they are mailing it to him today. Once the surgeon’s office receives their report, they will submit to the insurance company. I feel a bit like I’m circling an airport waiting for a runway to become available so that I can land. I am certain that once the insurance company gives the approval, things will move faster than I am prepared for and I will be complaining that everything is happening all too quickly. For now, I wait. On a separate note, I went to the eye doctor this weekend. For the first time in my life, I need glasses. Everyone in my family wears glasses or contacts. My brother needs glasses for reading, as did my mother and father before him. Both of my sisters have worn glasses most of their lives. I was hoping to escape wearing them altogether myself. Now I need glasses for reading. Also, I have developed an astigmatism, which makes seeing at a distance a little difficult. I pick them up on Wednesday. 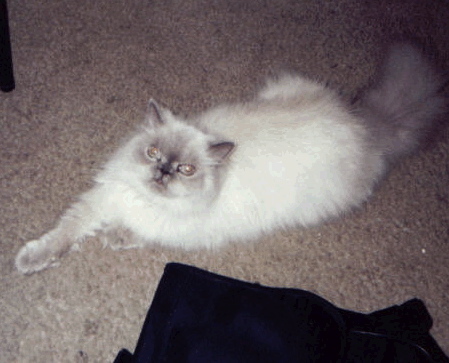 Today I am including a picture of a cat I had in the 90s. She was very old when I took her on. She had been a breeding cat. The breeder was going to put her down, so a friend of mine took the cat and gave her to me. Her name is Precious. She did eventually have to be put down as she turned out to be quite sick, but I loved her very much and tried to give her a good home for as long as I could. This entry was posted in diet, fat, gastric by-pass, skinny, Uncategorized and tagged cat, doctor, dr, fat, gastric bypass, skinny, skinny girl. Bookmark the permalink.